Tired of the explosions, (mainly Creepers) wrecking your worlds? 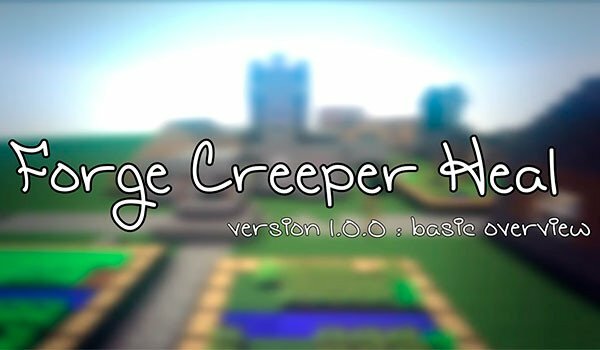 Forge Creeper Heal 1.10.2 is a mod that handles add a function that may have seen on more than one server Minecraft. Surely you have noticed that in most servers Minecraft, explosion of Creeper or when TNT explodes, the field is not affected. Well, this mod has to do something similar, but somewhat different, let’s see. This mod, no prevent the ground after an explosion shred both TNT, as Creeper, is responsible for regenerating the land automatically in a short period of time. So, after an explosion, in seconds, terrain or home affected by the explosion, it will return to its original appearance before the explosion. How to install Forge Creeper Heal Mod for Minecraft 1.10.2? Do not suffer by explosions, this mod regenerate any house or land affected!